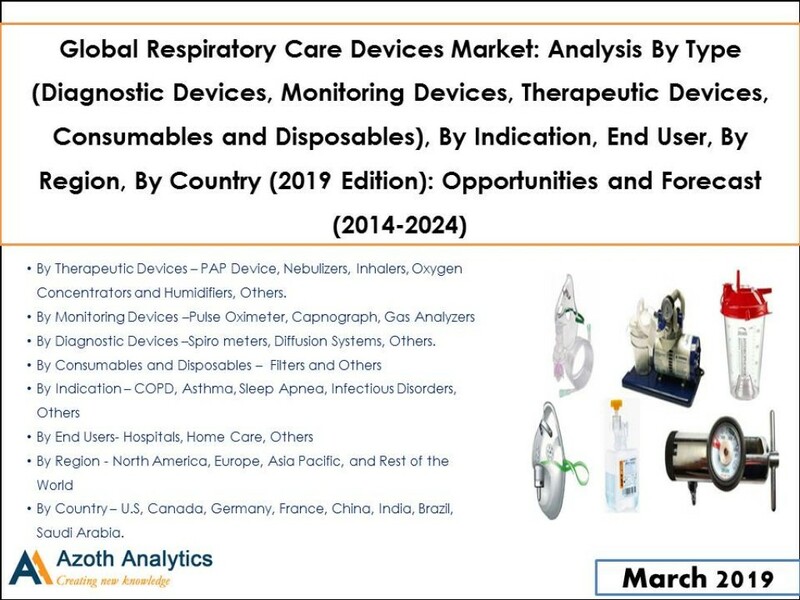 Hialeah Gardens, Apr 10, 2019 (Issuewire.com) – A comprehensive research report created through extensive primary research (inputs from industry experts, companies, stakeholders) and secondary research, the report aims to present the analysis of Global Respiratory Care Devices Market. The report analyzes the Respiratory Care Devices Market By Product (Diagnostic Devices, Monitoring Devices, Therapeutic Devices, Consumables and Disposables), By Diagnostic Type (Spirometers, Diffusion Systems, Others. ), By Monitoring Type (Pulse Oximeter, Capnograph, Gas Analyzers), By Therapeutic Type (PAP Device, Nebulizers, Inhalers, Oxygen Concentrators and Humidifiers, Others), By Consumables and Disposable Type (Filters and Others), By Indication (COPD, Asthma, Sleep Apnea Infectious Disorders, Others) and By End Users (Hospitals, Home Care, Others). The Respiratory Care Devices has been analyzed By Region (North America, Europe, Asia Pacific, Rest of the World) and By Country (U.S., Canada, United Kingdom, Germany, India, China, Saudi Arabia and Brazil) for the historical period of 2014-2018 and the forecast period of 2019-2024. According to Azoth Analytics research report “Global Respiratory Care Devices Market: Analysis By Product (Diagnostic Devices, Monitoring Devices, Therapeutic Devices, Consumables and Disposables), By Diagnostic Type (Spirometers, Diffusion Systems, Others. ), By Monitoring Type (Pulse Oximeter, Capnograph, Gas Analyzers), By Therapeutic Type (PAP Device, Nebulizers, Inhalers, Oxygen Concentrators and Humidifiers, Others), By Consumables and Disposable Type (Filters and Others), By Indication (COPD, Asthma, Sleep Apnea Infectious Disorders, Others) and By End Users (Hospitals, Home Care, Others), By Region, By Country (2019 Edition): Opportunities and Forecast (2014-2024) – By Region (North America, Europe, APAC, ROW), By Country (U.S., Canada, France, Germany, India, China, Saudi Arabia, Brazil)”, global market is projected to display a robust growth represented by a CAGR of 10.06% during 2019 – 2024. The product segment of Therapeutic devices has been witnessing growth at a noteworthy rate over the past few years backed by increasing production of technical advance PAP devices, the rising prevalence of COPD disorders as well as increasing healthcare expenditure. Amongst the regions, North America accounts for the largest regional share in the global respiratory care devices market in 2018. Key factors driving the robust growth rate of North America region include well-developed healthcare infrastructure, favourable regulatory reforms, surging adoption of technical advance respiratory care devices as well as rising old age population. The report titled “Global Respiratory Care Devices Market: Analysis By Product (Diagnostic Devices, Monitoring Devices, Therapeutic Devices, Consumables and Disposables), By Diagnostic Type (Spirometers, Diffusion Systems, Others. ), By Monitoring Type (Pulse Oximeter, Capnograph, Gas Analyzers), By Therapeutic Type (PAP Device, Nebulizers, Inhalers, Oxygen Concentrators and Humidifiers, Others), By Consumables and Disposable Type (Filters and Others), By Indication (COPD, Asthma, Sleep Apnea Infectious Disorders, Others) and By End Users (Hospitals, Home Care, Others),By Region, By Country (2019 Edition): Opportunities and Forecast (2014-2024) – By Region (North America, Europe, APAC, ROW), By Country (U.S., Canada, France, Germany, India, China, Saudi Arabia, Brazil)” has covered and analyzed the potential of Global Healthcare and provides statistics and information on market size, shares and growth factors. The report intends to provide cutting-edge market intelligence and help decision makers take sound investment evaluation. Besides, the report also identifies and analyses the emerging trends along with major drivers, challenges and opportunities in the global respiratory care devices market. Additionally, the report also highlights market entry strategies for various companies across the globe. By Therapeutic Type (PAP Device, Nebulizers, Inhalers, Oxygen Concentrators and Humidifiers, Others). Company Analysis – Philips Group, ResMed, Fisher & Paykel Healthcare, Hamilton Medical AG, Masimo Corporation, General Electric Healthcare, Invacare Corporation, Medtronic.